Nimbus II. 2012. Digital C-type Print 75 x 112 cm. Hotel MariaKapel, Hoorn, Netherlands. Berndnaut Smilde/Photo by Cassander Eeftinck Schattenkerk. I’m a terrible blogger in some ways. I’m whimsical, coy, and frequently silent. I blame this on being an INF(T)P (I also love blaming perceived flaws on personality types and star signs — I’m a Pisces — because it helps me bear them philosophically). Anyway, seeing as I haven’t posted in a while, I’ve been racking my brain for the past few weeks for something to post about. I’m extremely picky about what I feel is “worthy” of posting. It can’t just be something cool I found, where I post a brief introduction and a link and am done with it; it has to be something I can explore and build on to say something about myself or my perception of the world (very INTP). I don’t know why I’ve set this requirement for my blog, but there it is. rather than enter into the design of man’s hate. and not pretend my life could better serve. Another morning comes with its strange cure. through me, toward the ground. 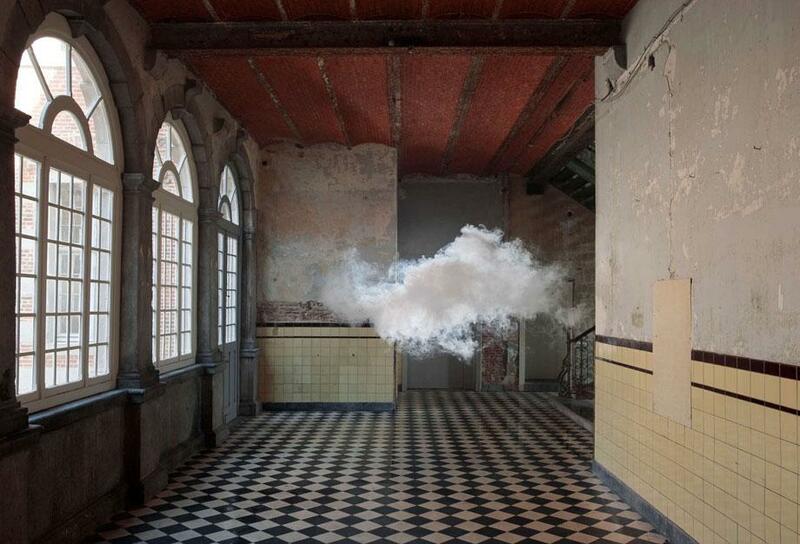 During this morning search for tattoo inspiration, I came across (not for the first time) the photographs of Dutch artist Berndnaut Smilde, whose surreal images of clouds within empty interior spaces have garnered a lot of attention this year. These images are not of clouds photoshopped into spaces; Smilde creates the clouds himself by misting the air and then turning on a fog machine, and an assistant takes the photo at the right time. Nimbus D’Aspremont. 2012. Digital C-type Print 75 x 110/125 x 184 cm. Kasteel D’Aspremont-Lynden, Rekem, Belgium. Berndnaut Smilde/Photo by Cassander Eeftinck Schattenkerk. The creation of the cloud, as performance or installation art, is a statement on impermanence and the awe one feels when watching something mysterious and unique (as no two clouds are exactly alike) unfold. The photograph, however, is representative of mankind’s special ability and deep desire to make the evanescent (more) eternal. I don’t find the surreal threatening, however. I’m always drawn to the liminal and the strange. Like Emily Dickinson, I know it’s my kind of art when “it makes my whole body so cold no fire can warm me.” Viewing his photographs is a spiritual confirmation. It nods to a wordless truth — something about the beauty of transience, how things have power and beauty simply because they are impermanent — that is wonderful in every sense of the word. It’s like seeing a spirit in daylight. Nimbus Minerva. 2012. Digital C-type Print 75 x 113/125 x 188 cm. Academy Minerva, Groningen, Netherlands. Berndnaut Smilde/Photo by Cassander Eeftinck Schattenkerk. Nimbus Platform57. 2012. Digital C-type Print 125 x 198 cm. The Hague, Netherlands. Berndnaut Smilde/Photo by Cassander Eeftinck Schattenkerk. Nimbus Cukurcuma Hamam I. 2012. C-type Print on Dibond, 125 x 184 cm. Berndnaut Smilde/Photo by Onur Dag. Love the post and your writing, of course. Always interesting and inspiring. I’m glad you think it’s cool, too! I was so taken with those images. I’d love to attend one of his shoots and experience the process. I love the ‘cloud art’! Reminds me of the old saying: “cloud hanging over your head” , which people usually use with negative connotation, but I think of it as either a “guardian” following to learn from you or watching over you (with humor, in my case) …. or at other times’ being the cloud leading & enticing the viewer….. depends on whether I am wearing my big girl leader or little girl follower hat that moment! As for the “fleeting moments” thing — aren’t they all … fleeting? The one thing I have learned here is “viewing” is choosing to be a “watcher” where life is passive instead of creating this moment to attract the next. Great blog, Heidi! Thanks! I’m glad you liked the post. You’re right that all moments are fleeting, which means that every moment is valuable and beautiful (even the sad moments, which have their own kind of beauty that is often difficult to appreciate except from a distance). To your “life is passive” comment: I agree that viewing is passive, and I think that a full life necessitates both passivity and activity. Without passivity, one can’t truly see things (objects, people, actions, events) and give them meaning; and obviously, without activity, nothing would ever happen! Writing is interesting in that sense because the writer is observing and acting simultaneously – or acting by observing. Something like that.
. The fist picture is very Rene Magritte… my favorite artist!